Centifolia Organic Witch Hazel Floral Water calms, soothes the small inconveniences of delicate skins and regulates the mixed to oily skins without attacking them ! Known for its soothing, firming, astringent and purifying properties, it is ideal for redness and sebum regulation ! This organic hydrolat cleanses the traces of your make-up. With Centifolia Witch Hazel Floral Water Spray, your skin is moisturized and soft ! 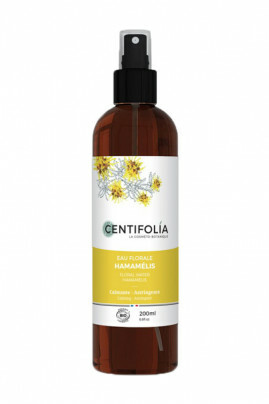 Centifolia HAMAMELIS Natural Floral Water is perfect for sensitive and combination skin ! Apply Hamamelis hydrolat morning and/or evening with a cotton pad soaked or sprayed, as a skin care product or simply to complete the make-up removal.